I’m not sure why my corner grocery store had fava beans this week, but have them they did. Perhaps it’s the unseasonably cool Summer we’ve had (not one day above 90º! not one! ), tricking the plants into growing their Spring produce now, or maybe someone was just hiding them in a closet somewhere; but there they were, those fat green pods, wedged in between the cucumbers and the tomatillos. Of course, I snapped them up, unseasonable or not. I had originally intended to make this recipe with always-in-season frozen edamame, but had based the idea off of an incredibly good smashed fava bean spread I invented last Spring. And, randomly, here were favas! The circle was complete. This recipe makes more fava bean filling than you’ll need for the bread, but the leftovers are well worth having around, especially if you’ve got a mild soft cheese and a baguette on hand. The filling can of course be varied to suit your taste (add a few slices of crumbled bacon for a real treat), but I’ve purposefully made it very full-flavored, to make it shine a bit more in the bread. I found the level of intensity just perfect for the bread, but perhaps a bit much for eating plain. If you find it too intense, just add some extra favas to desaturate it a little. 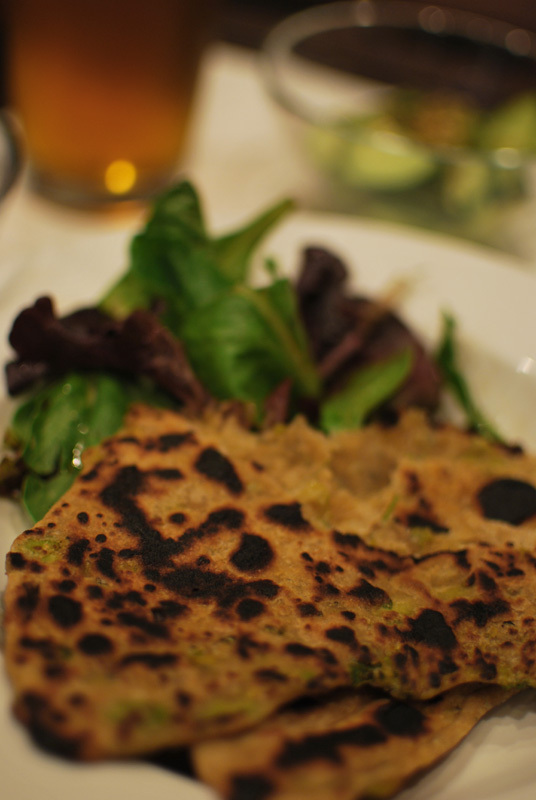 For the bread, I felt a rustic flatbread was the best way to incorporate such a filling, and drew inspiration from whole-grain Indian flatbreads, namely the filled paratha. These flatbreads cook very quickly, and end up soft, satisfyingly chewy, and slightly crunchy around the very edges. The process of brushing the dough with olive oil and folding produces a few beautiful layers of dough, almost rather like puff pastry, but not nearly as airy, and far simpler. They’re best just out of the pan, but can be frozen and thawed quickly to relative success. The end result, lightly charred and studded with bright green bits of fava and fresh herbs, was delightful served with a salad simply dressed with oil and vinegar, and topped with a bit of plain yogurt. For a heartier, more traditionally Indian take, however, serve with your favorite dal or curry recipe. Enjoy! 1. To make the dough, whisk the flour and salt together in a bowl. Add 3 tablespoons of olive oil and 1/2 cup water. Mix together until incorporated. Add just enough additional water (1 to 2 tablespoons) to form a dough, if necessary. 2. Knead on a work surface until smooth and elastic, about 8 to 10 minutes. Wrap dough in plastic wrap, and let stand at room temperature 1 to 3 hours, or refrigerate for up to 24 hours. Let come to room temperature 30 to 60 minutes before proceeding. 3. To prepare the fava bean filling, simmer the shelled fava beans in unsalted water for 25 to 30 minutes, or until very tender. Drain, and place in a large bowl. Set aside. 4. In a nonstick skillet, heat 2 tablespoons olive oil over medium-high heat. Sauté the white parts of the scallions, the garlic, and chile for 1 to 2 minutes, or until fragrant and starting to soften. Add the cooked favas and cook an additional 3 to 4 minutes, or until beginning to color. Return mixture to bowl. 5. Mash fava mixture with a fork or potato masher. Stir in remaining ingredients, tasting to correct seasoning. If the mixture looks dry and crumbly, add additional olive oil or dairy (buttermilk or yogurt) as needed. Set aside. 6. Divide the dough into 8 equal portions and roll each into a ball. Keeping the remaining balls covered, push your thumb into the center of each ball to make a deep depression. Fill with 1 tablespoon bean filling, closing dough around it, and pinching to seal. Set aside, and repeat with remaining dough. 7. Flatten each ball, seam side down, into a disk and roll out to a 6 inch round on a lightly floured surface with a lightly floured rolling pin, or as large as the dough will allow. Brush with olive oil and fold in half to form a semi-circle. Brush again with olive oil and fold in half again to form a quarter-circle. Set aside, cover, and repeat with remaining balls of dough. 8. Brush each piece again with olive oil, and fold in half again to form a triangle. Roll out into a triangle with roughly 6-inch sides on a lightly floured surface with a lightly floured rolling pin. Set aside, keeping dough covered. Repeat with remaining dough. Do not overlap pieces, or they will stick together. 9. Heat an un-greased 10 to 12 inch nonstick pan, cast-iron skillet, or griddle over medium-high heat until hot. Cook each piece of dough until bubbles form and undersides are browned darkly in spots, about 30 to 60 seconds. Brush top with additional olive oil, and flip over. Brush cooked side with olive oil and cook until dough is cooked through and underside is browned in spots, 30 to 60 seconds more. Remove to a plate, and repeat with remaining dough. Finished breads are okay to stack. Serve warm. 1. I found it necessary to firmly pinch the dough together, so that the filling didn’t come through the dough while rolling out. Even so, it wasn’t always successful. Once the filling starts poking through, start the folding procedure. Remember, it’s better to roll the dough a little bit many times, than it is to roll it all at once. Just do what you can with each piece, set it aside, and move on to the next piece. 2. To prepare favas in the pod, split open the pods and remove the beans. Meanwhile, bring a saucepan filled with unsalted water to a boil over high heat. Prepare a bowl filled with ice water to shock the beans. Drop the unshelled beans into the boiling water and cook for 1 minute. Drain the beans and quickly plunge them into the ice water. With your fingernail, pierce the skin of each bean near one end and squeeze the bean gently to pop free of the skin. Don’t worry if the beans separate into halves. Proceed as directed. 3. Any leftover fava bean filling is delicious spread on a baguette with a good soft cheese, or even tossed with pasta. 4. Perhaps it goes without saying, but if you can’t find favas, you can certainly substitute frozen shelled edamame. Just make sure to cook them until they’re very soft before mashing. I LOVE eating fave beans but I LOATHE cooking them. That feet smell. Blech.